the rain had refused to stop falling. there was no escaping, and it had become maddening. i made a snap decision and checked out of my hostel, determined to escape the confinement of the indoors by finding another city further north that might have escaped the weathery onslaught. as i was checking out, a dutch couple i’d not yet met who had been staying in the hostel was also leaving. i overheard that they were traveling to tangiers, which was where i had been eventually planning on going to. i knew there were no buses running that day due to the storms, but i knew there would be a taxi driver crazy enough to drive me the 2 hours to the northern coast. i politely asked them if they wanted to share a taxi and we trudged out into the rain together. i had expected to be able to get a couple taxi drivers to enter into a bidding war for who would take our business, especially on a slow day in heavy rain, so i was shocked when the opposite actually happened. the first driver we talked to set the price rather high, and then all the other drivers in the area stuck to the price that they had heard set. it took us 20 minutes to find anyone who would come down from the price even a little, and when we did it wasn’t much. but we paid the fare and took off into the storm. on the ride i got to know thomas and jolande. they were a couple from the netherlands and actually hadn’t been together very long, so i was surprised that they were traveling together. i’m not sure why, because when i thought about it, traveling with someone is one of the best ways to get to know the “real” version of them, so why not do it early on in the relationship? jolande was a small business owner who would travel to exotic countries like morocco and purchase fancy antiques and rugs and the like and then ship them back to her shop in the netherlands where she could sell the items at a premium. i could tell she was a very shrewd negotiator and knew what she was doing when it came to her business. she also had a pure heart that shined through when she talked about ideas passionately, and a sweet, caring way about her. thomas was a musician, and a funny one at that. he reminded me a lot of jeff goldblum in jurassic park. he wore thick-rimmed glasses and had a hip style about him and a clever sense of humor. they both liked to smile and laugh a lot, and they were both really tall, as the dutch often are. i guessed that they were both around 40 years of age, but they were both young souls, wild and free, and i got along with them quite well. we talked about music and literature and travel, and found that we had a lot of mutual interests and tastes. i took a moment to thank the stars that they were cool, because a 2.5 hour ride in flooding rainstorms in the north of morocco with an awkward cab driver who spent most of the drive shouting into a tiny cellphone with boring or annoying side conversation would have been almost unbearable. 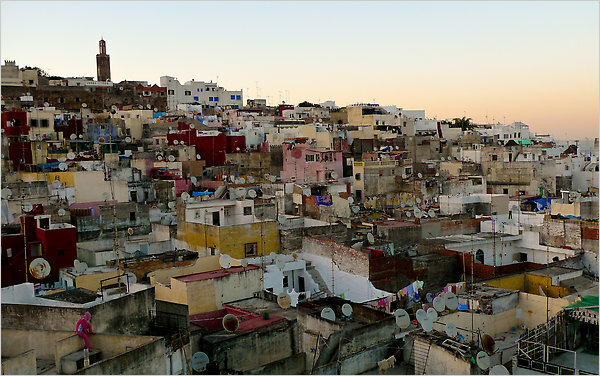 we arrived at the medina of tangiers and parted ways, agreeing to meet up later that night. almost immediately the touts and vendors were upon me, trying to get me to follow them to a hostel, or buy hash, or eat at their restaurant, or a dozen other propositions. i didn’t even have the patience anymore, i was tired of negotiating, tired of saying no, i just wanted some quiet. i put my headphones in and turned on my ipod while i searched for my little hostel located down a dark back alley. that night i met up with thomas and jolande and we left the old medina in search of an old bar that was famous for being jack kerouac’s favorite watering hole, called the tanger inn. we knew very little about it other than the fact that it was best known during 50s, 60s, and 70s as central hub for nightlife of the beatnik travelers and iconic authors like allen ginsburg, william s. burroughs, and of course, jack kerouac. i was reading kerouac’s “on the road” at the time, so i was particularly enthusiastic about retracing some of the man’s paces in a time when i was in the middle of my own wandering journey.